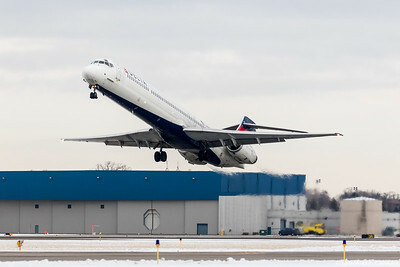 This gallery contains images of airliners taken in 2015 (primarily at KMSP). A pair of IAE V2528-D5 engines, each packing 28,000 lbf of thrust, bring a McDonnell Douglas MD-90 to a halt in Minneapolis with a mighty roar of reverse thrust after a flight from San Diego, California. 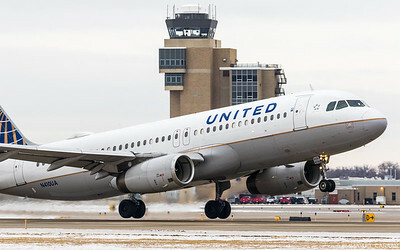 A United Airlines A320 bound for Denver, rushes out of Minneapolis on December 28, 2015 just in time to escape a major snowstorm. 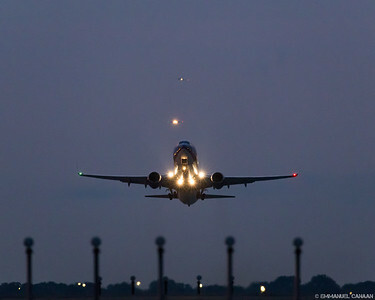 A Sun Country Airlines Boeing 737-800 climbs out of Minneapolis, Minnesota on runway 12L. 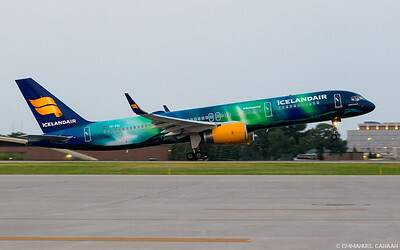 The beautiful Hekla Aurora, an Icelandair Boeing 757-256, departs Minneapolis on its way to the moon. 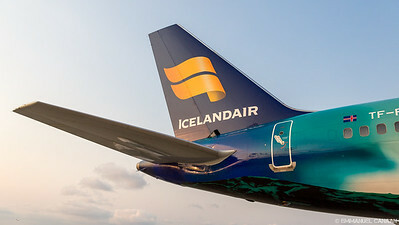 This special livery is all about the vibrant colors of the Aurora Borealis. 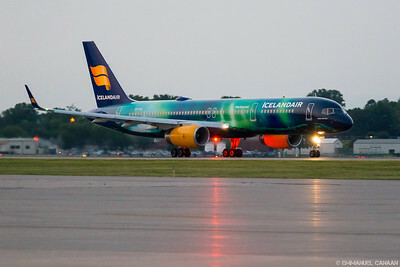 Here the Icelandair 757-256, dubbed Hekla Aurora, adds some additional color in the form of its beacon as it departs Minneapolis, bound for Reykjavik. 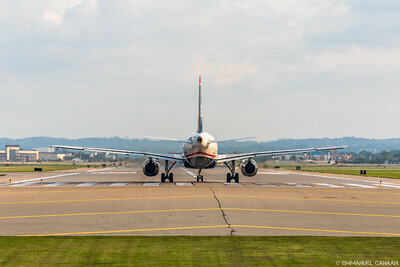 An American Airlines A320 still in US Airways livery, coasts into the gate in Minneapolis after a flight from Phoenix. Hekla Aurora, an Icelandair 757-256, basks in the light of the setting sun on a nice day in Minneapolis before heading back to Reykjavik. 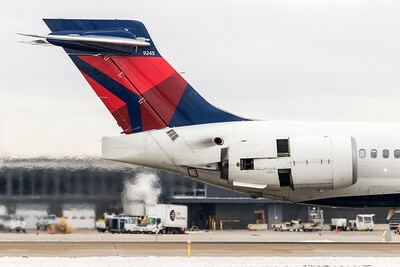 A former Northwest Airlines DC-9-30 sits perennially exposed to the elements on the Minneapolis airport field. It is now a training aircraft used by the airport police and fire departments. 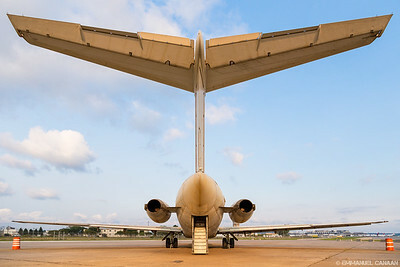 It stopped flying after it was heavily damaged by a fuel truck that collided with it in 2005. 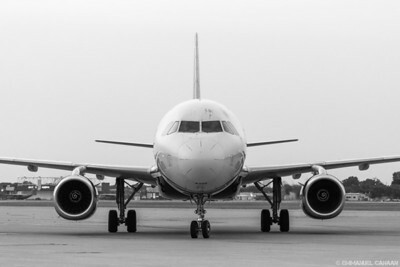 The driver of the fuel truck fell asleep at the wheel and impacted the nose section of the aircraft, prompting Northwest to scrap the airframe. 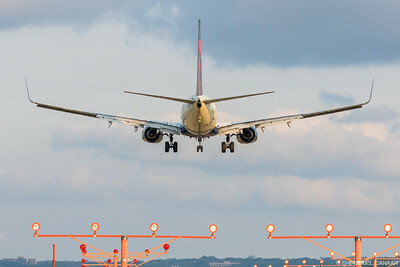 A Delta Airlines Boeing 737-800 spreads its wings as it crosses the threshold of runway 12R on arrival into Minneapolis, Minnesota. 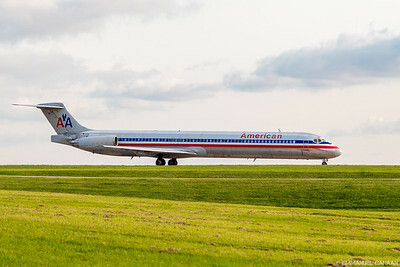 An American Airlines MD-83 takes a wrong turn and gets lost in the Minnesota countryside on its way to Dallas. 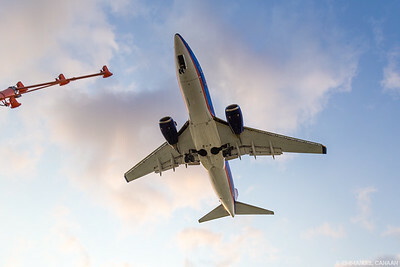 A Sun Country Airlines Boeing 737-800 shows us her belly as she thunders overhead for a landing on runway 12R in Minneapolis, Minnesota. 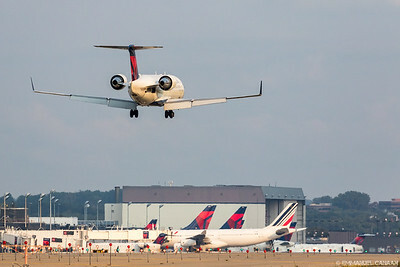 A Delta Connection (SkyWest Airlines) Bombardier CRJ-200ER arrives in Minneapolis after a flight from Rapid City, South Dakota. A Delta Airlines McDonnell Douglas MD-90 gets lost in a mix of heat haze and jet wash as it rockets out of Minneapolis on Runway 17. 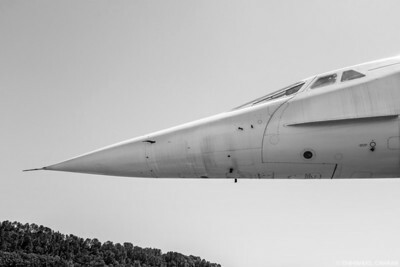 Concorde G-BOAG, at Seattle's Museum of Flight, shows off a speed-focused design that remains unmatched by any civilian airliner in the skies today. 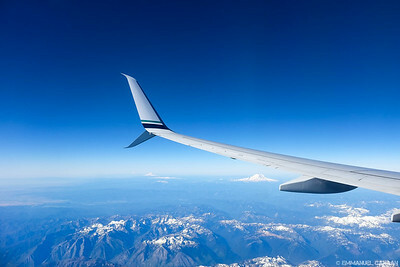 An Alaska Airlines 737-900 soars high above Washington state as it prepares to land in Seattle. Visible in this image are Mt. Rainier, followed by Mt. Adams and Mt. Hood in the distance. Barely visible is Mt. Saint Helens. An Air France Airbus A340-300 provides Minneapolis with an exotic and rare sight as it heads back home to Paris. 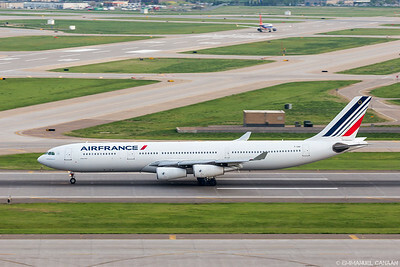 An Air France A340-300 stretches her wings in preparation for a flight from Minneapolis to Paris. 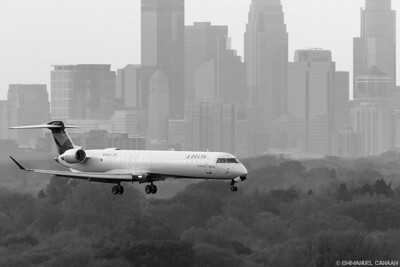 The ghostly outline of downtown Minneapolis can be seen as a Delta Connection Bombardier CRJ-900 cuts through the dense air after a flight from Cleveland. 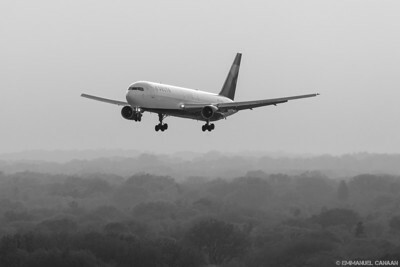 A Boeing 767-300 descends through misty air into the urban jungle of Minneapolis after a flight from Los Angeles. 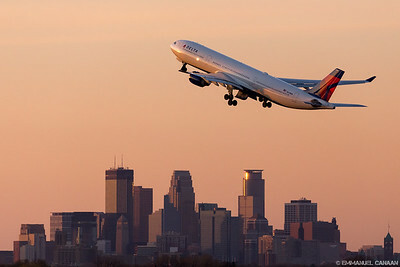 A Delta Airbus A330-300 climbs out of Minneapolis on a warm spring night as it prepares to race away from the setting sun towards Amsterdam. 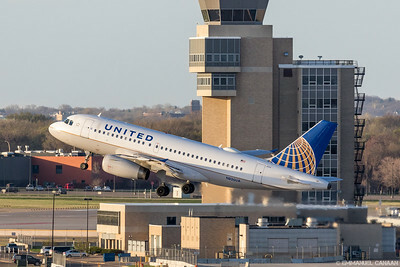 A United Airlines Airbus A319 buzzes the Minneapolis tower on its way to Chicago. 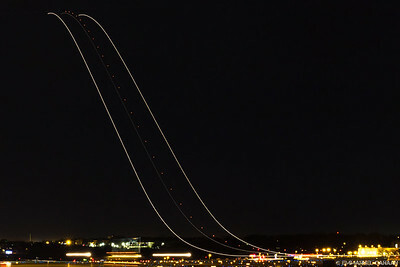 A UPS MD-11 paves a highway in the sky on takeoff from Minneapolis to its home base in Louisville, Kentucky. 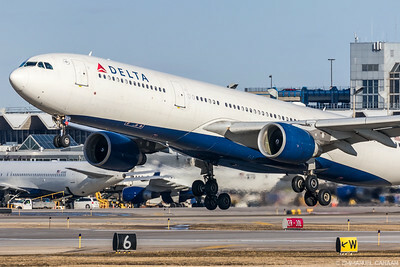 A Delta Airbus A330-300 shows off its graceful lines as it surfs among the clouds on its way from Minneapolis to Amsterdam. A Delta Airbus A330-300 jumps out of Minneapolis on its way across the pond to Amsterdam. This particular jump resulted in 7 hours and 23 minutes of air time. 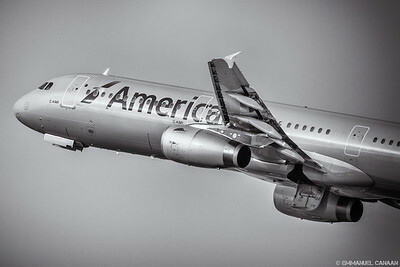 The aluminium fuselage of an American Airlines MD-82 gleams in the sun as it cruises out of Minneapolis towards Chicago. 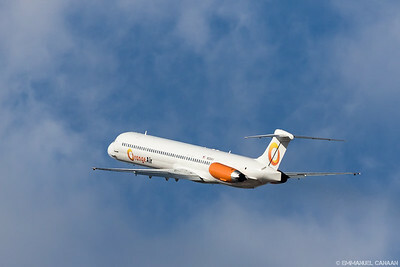 An Orange Air MD-83 is seen in her colorful orange livery just moments before disappearing into the wild blue yonder. 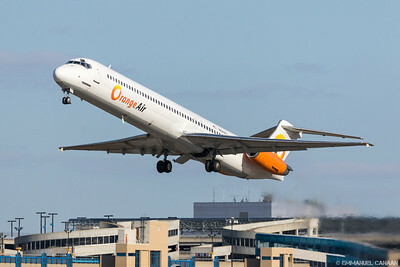 New Florida charter airline, Orange Air, climbs out of Minneapolis on its way towards Omaha with one if its two McDonnell Douglas MD-83s. 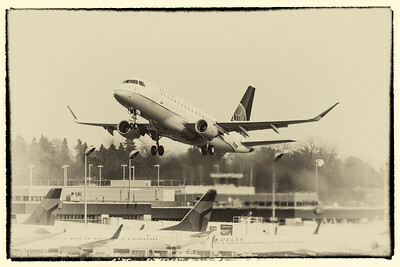 The Silver Surfer (an Airbus A321) rushes out of Minneapolis to fight its archenemy Boeing in another part of the world. 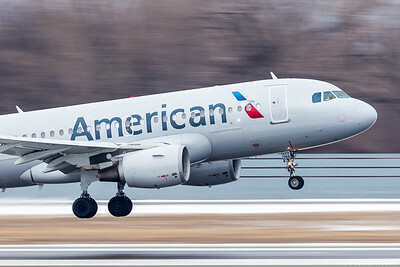 Barely a toddler in airplane years, this 7-month-old American Airlines A321 throttles out of Minneapolis on the way to Charlotte. 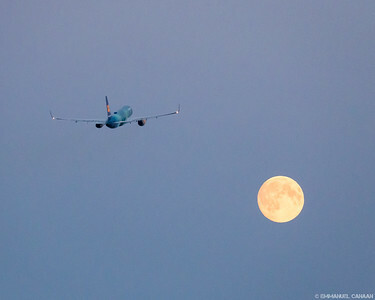 Its first flight took place on August 8, 2014. An Embraer 175 shuttles intrepid travelers out of Minneapolis on April 1, 1898 to explore the rapidly expanding United States of America. 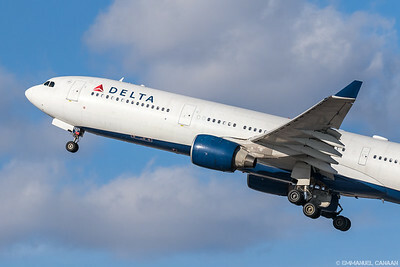 A Delta Boeing 767-300 launches out of Minneapolis on its way to Orlando, Florida. 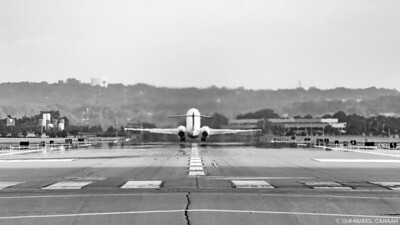 It is one of many round trips it will make during the month of March 2015 between MSP and MCO. 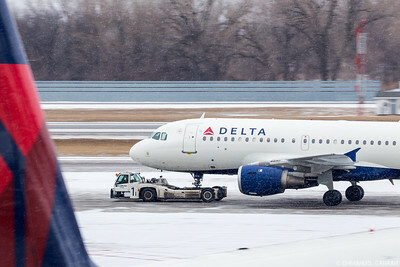 A Delta 767-300 "Heavy" plows through the snow in Minneapolis after a flight from sunny Phoenix. 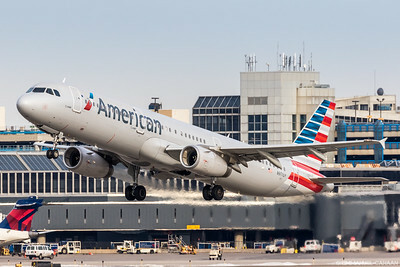 An American Airlines Airbus A319 screams into Minneapolis after a flight from Charlotte. 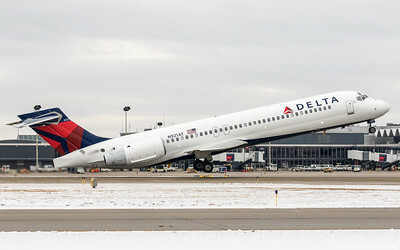 A Delta Embraer 175 completes its leap from Dallas to Minneapolis with a final burst of speed just seconds before touchdown. 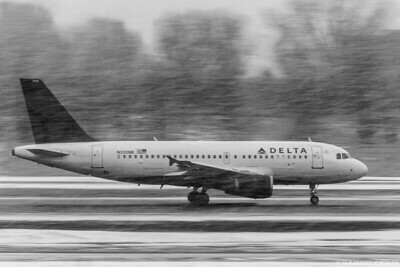 A Delta Airbus A319 rushes to escape a Minnesota snowfall as it seeks out more pleasant conditions in Kansas City. 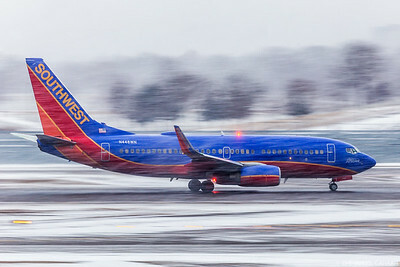 A Southwest Airlines Boeing 737-700, Spirit of Kitty Hawk, rushes out of Minneapolis to escape conditions that are very much not reminiscent of the Wright Brothers' first flight. The aircraft was so named as it was delivered on the 100th anniversary of that famous flight. 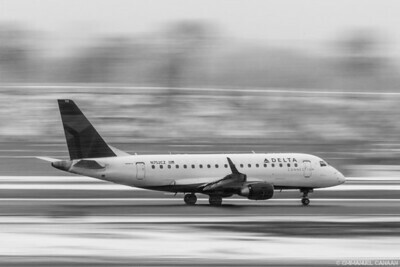 A Delta Connection Embraer 170 shoots by in a flash on its way from Minneapolis to San Antonio. 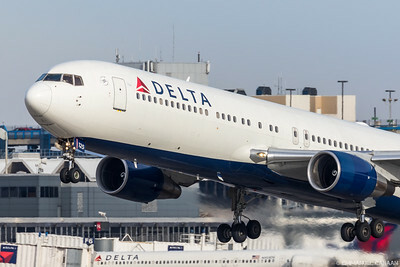 The longest narrow-body twinjet ever produced, a Boeing 757-300, is seen here in Delta livery accelerating out of Minneapolis towards Los Angeles. 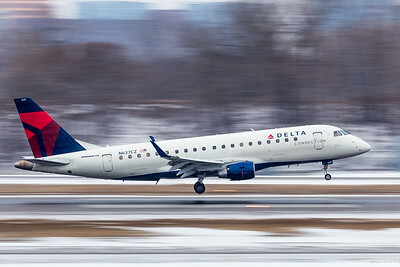 Small, yet powerful, a Delta Connection Embraer 170 blasts out of Minneapolis like a rifle bullet towards Chicago. 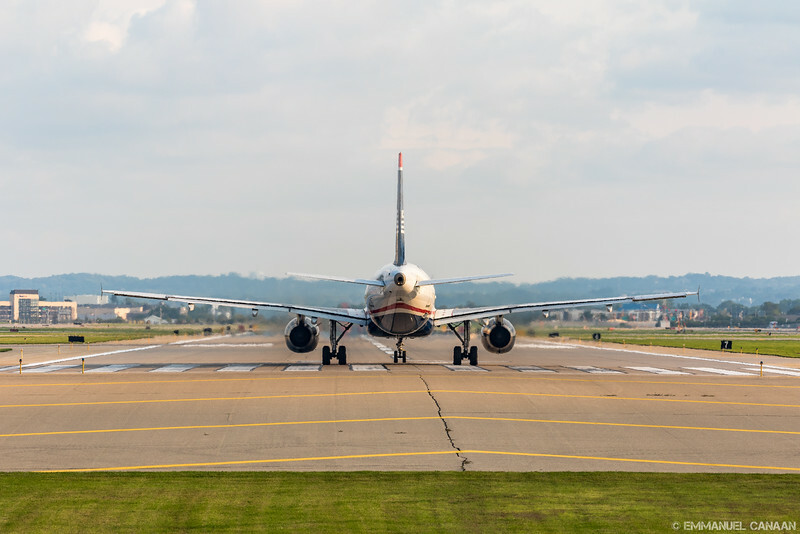 A sickly Delta Airbus A319 sheepishly allows itself to be repositioned by more pedestrian means while its healthy brethren look on. This aircraft spent the night in Delta's Minneapolis maintenance hangar before departing to Philadelphia the following afternoon. 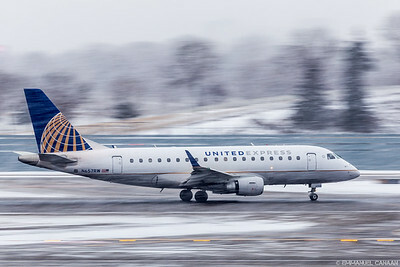 A United Express Embraer 170 streaks through the winter snow of Minnesota on its way to Newark. 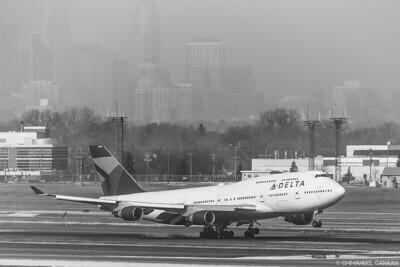 A Delta Boeing 747-400 floats down through the hazy Minneapolis air after a flight from Tokyo Japan. The 747 was replacing a 777 that was out of service due to an upline hard landing in Singapore. For this particular arrival, the 747 executed an autoland, Cat IIIa approach where the aircraft performs an autonomous landing under crew supervision. 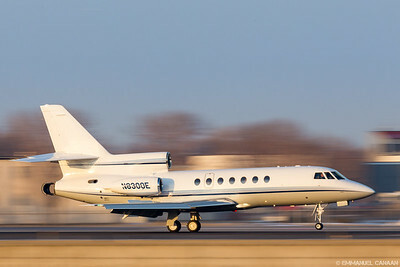 A Dassault Falcon 50 slams on the thrust reverse as it desperately tries to slow its prodigious speed on arrival in Minneapolis.